Many churches have moved from having committees to ministry teams. 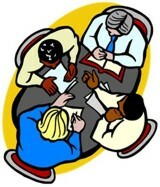 Some groups called "committees" already function as a team. Some groups called "teams" function more like a committee. Do not confuse terminology with practice. A church needs more than a face-lift to move from behaving like an institutional organization to acting like the living organism God designed it to be. To function with effective ministry teams, a church must conform at the very core of its values and beliefs to God's design for the church. If a church has not truly been following God's design, anything short of a cultural shift in the way the church functions, may produce short-term results, possible confusion, and may hamper future efforts to change. Ephesians 4:11-12 teaches that God gave some the responsibility and ability "to prepare God's people for works of service, so that the body of Christ may be built up." Given all the different areas of ministry within a church, the pastor cannot effectively equip everyone. A variety of ministry leaders, each serving with a ministry team, would have a smaller span of influence and therefore would have the potential to shepherd with greater effectiveness. A caution for developing ministry teams is that they do not become isolated groups to themselves but rather that they fit within the whole. Bringing ministry leaders from each group together to form their own team under the shepherding of the pastor will help to maintain that unity and coordination. Keeping each team accountable to how it fits into the overall vision and purpose of the church is critical to staying within God's design for the church. Ministry teams that are islands to themselves fragment the body and may pull the church further from God's design than closer. The leadership of the group will help determine whether it functions as a ministry team or a committee. Leaders who make most of the decisions, stifle initiative by members, and tend to control the meeting usually chair a committee. Leaders who encourage joint decisions, initiative, and mutual accountability usually coach a team. A ministry team leader promotes interdependence, not dependence. A ministry team leader empowers others, rather than exert power over them. The concept behind ministry teams is that people serve together, developing a group identity and moving together toward the accomplishment of certain goals. Consequently, if one of the members is like that sheep that likes to wander off on its own or one of its members is hurt, the whole group will be affected. 1 Corinthians 12:26 well fits the realities of a ministry team, "If one part suffers, every part suffers with it; if one part is honored, every part rejoices with it." While cultivating that interdependence among all, the leader must also be concerned about the personal fulfillment of each member reaching his/her potential in Christ because every member will affect the whole. Weak, sickly, or sluggish sheep, may hold back the whole group. Strong-willed sheep may frustrate the whole group. Overly zealous or hyper sheep may put the whole group on edge. If you don't know your sheep, you won't deal with these issues in ways that are good for the whole yet accepts, accommodates, and ministers to the individual. Team members bring more than their skills to the group. The ministry team leader must not only identify what training members need to enhance their skills but also what support they need to build more Christ-like character and to develop and channel intrinsic, godly motivations and maturity. Personal deficiencies will weaken the team. Personal growth will strengthen the team and propel it forward into greater impact. Ministry teams should not only serve together but they should also enjoy fellowship with one another. However, a team in the workforce or in the sports arena can also accomplish objectives and build camaraderie with each other. What sets ministry teams apart from any other kind of team is the One from whom "the whole body, joined and held together by every supporting ligament grows and builds itself up in love, as each part does its work" (Eph. 4:16). He supersedes the task as the work is done both for Him and through Him. Knowing Him is the ultimate goal. He is the source of the team's ability to find unity in the midst of diversity. "In Him the whole building is joined together and rises to become a holy temple in the Lord" (Eph. 2:21). The Shepherding Ministry Manual contains the content on this page along with some questions for further reflection and evaluation to help personalize this teaching.